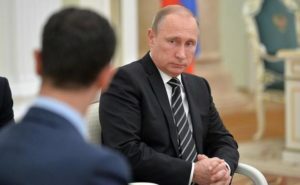 HAIFA, Israel — In a recent secret visit to Moscow, Syrian president Bashar al-Assad told Vladimir Putin that he would assure quiet on Israel’s border. I am constantly amazed how the mainstream media [even here in Israel] can ignore the most interesting things that are happening, while concentrating on a few headline topics and such fascinating issues as Sara Netanyahu’s household expenses. Events over recent months and years have resulted in a situation where Israel is more secure in the Middle East than it has ever been, with one significant exception — the northern front. Conventional wisdom indicates that as soon as Hizbullah can extricate itself from the Syrian civil war, it will attack Israel with its tens of thousands of rockets and missiles. Well, recently, just before Bibi’s latest visit to Czar Vladimir in Moscow, Putin had a visit from none other than president Bashar al-Assad of Syria. It would appear that the good ophthalmologist had a message for Netanyahu, which he wanted Putin to pass on, namely that if Israel would support the Syrian regime, he, in return, would assure the safety of Israel’s border with Syria, as he in fact did for many years before the civil war began. Putin was, of course, delighted, since he has been trying with some success to shore up Assad’s depleted armed forces in order to protect Russia’s air and naval bases on the Mediterranean coast. In addition, the Iranian Quds Force troops deployed by the ayatollahs to fight along with their co-religionists in Syria, were having a very bad time of it, losing not only ordinary troops but several general officers. Quds Force commander and erstwhile military genius Gen. Suleimaniyeh has not been seen outside of Iran for a while. Additionally, the main organization of Iranian Kurds outside of Iran has declared war against the regime and anti-government actions have escalated, not only in the Kurdish area but also among the Arab and Baluchi populations. Uneasy, all of a sudden, lies the head that wears the Supreme Leader’s turban. With Turkey taking itself out of the power equation temporarily to concentrate on its own political/military/economic woes, there is no doubt that both Israel and the Kurds of Syria and Iraq, who have been remarkably successful against Islamic State of Iraq and Levant (ISIL), have benefited greatly. If there is any reality to Assad’s offer, Israel will benefit even more. Just as Egypt and Saudi Arabia are reining in Hamas at a time when the Palestinian leadership on the West Bank is in the last stages of decrepitude, a Syrian-Israeli-Russian coalition to confine Hizbullah to its southern Lebanese base would be much in Israel’s interests. But, you say, Hizbullah can just as well attack from Lebanon. Yes, but it is easier to counter such an attack than one that simultaneously takes place across the Syrian border. In any case, if there is any likelihood of Hizbullah being attacked on its flank from Syria while facing the IDF to the south, we can understand why Nasrallah’s rhetoric recently has undergone a substantial alteration. A final tickler: Abbas met recently with the leader of the Iranian Kurdish movement. Now what do you suppose that means? Remember what the scorpion said to the frog after he stung him halfway across the Suez Canal and the frog asked him why, since now he would die also? “This is the Middle East”. Norman A. Bailey, Ph.D., is Adjunct Professor of Economic Statecraft at The Institute of World Politics, Washington, D.C., and a researcher at the Center for National Security Studies, University of Haifa. He was formerly with the U.S. National Security Council and the Office of the Director of National Intelligence.